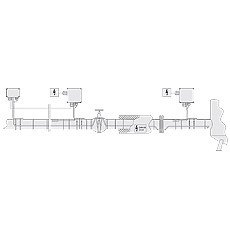 The BARTEC HTSB heating system covers a wide range of applications in trace heating. Frost protection, temperature maintenance and also a combination of temperature increase and temperature maintenance is possible in Zone 1, 2, 21 and 22. The HTSB heating tape, which is a part of the HTSB system, can be supplied in power outputs between 15 W/m and 90 W/m at 10 °C. This makes it easy to adapt the output to the heat losses. The protective outer sheath of the cable is made of fluoropolymer plastic.